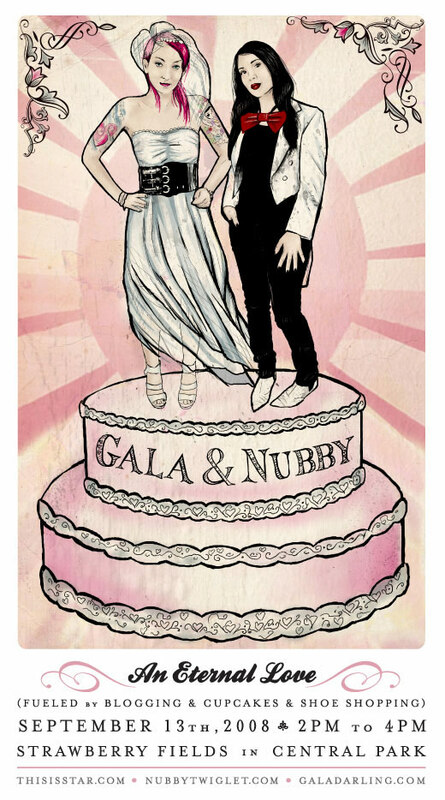 I made this flyer for Nubby & Gala’s birthday, I mean, WEDDING! I’ll be in attendance along with the rest of the ladybloggers. You should be there too! Also, NYC FRIENDS: E-mail me if you want to hang, my schedule is extremely packed already. OH MY GOSH, STAR! This is epic!! I love it! Thanks lady! Maybe we’ll see you next year? can anyone come? really, ANYONE? even if all i have to wear is sweatpants? Oh yes, it is picnicky goodness for all. O M G. You are one overly talented chick. That invitation is truly epic. You totally captured their essence. lol. i’ve been so busy with school and leaving all my rss readers untouched, i didn’t know you made this! gala showed me this today when we met today. it’s SOOOO CUTE!!! i think it’s hilarious. i love it!! LOVE IT! My birthday is Monday the 15th, so I am digging all the Virgo love out there. Well done, love the delicate quality of the lines and coloring. Saw your lovely work on the invite on Nubby;s and Gala’s blogs so thought I’d tottle over here & tell you I think it looks simply delightful. Your work is fab. Have a top time in NYC! Thanks ladies! I look forward to seeing you this weekend!! It was great meeting you and you looked just lovely in red. And I’m glad I got them the rings – your ceremony was lovely!